For some traders, the drawdowns in the Martingale system are just too scary to live with. That “roller coaster” ride ends-up causing them sleepless nights and stomach ulcers. However, there is an alternative. 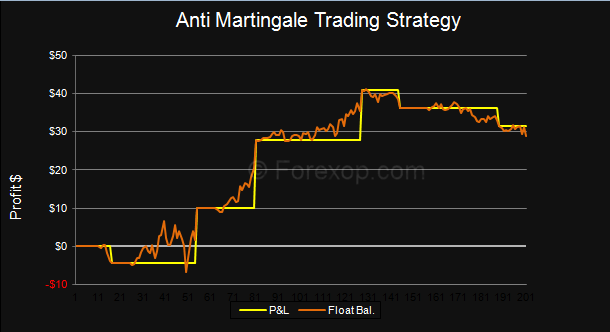 The anti Martingale system does what many traders think is more logical. 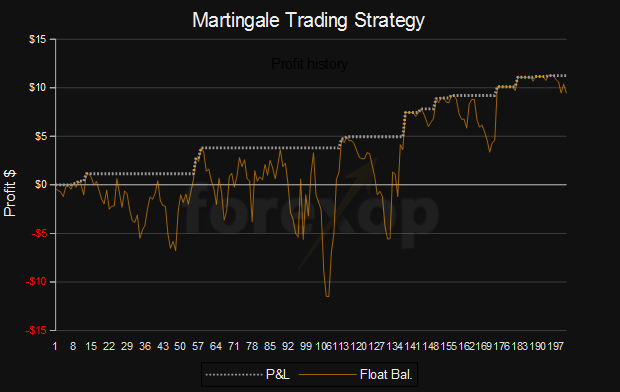 “Martingale in reverse” hangs on to winning trades, and drops losers. If that sounds better, read on. The standard Martingale system closes winners and doubles exposure on losing trades. If you’re not familiar with this strategy, see this other article here on Forexop. While it has some highly desirable properties, the downside with it is that it can cause losses to run up exponentially. The reverse Martingale, as I’m going to describe now does the exact opposite. It closes losing trades, and doubles winners. The idea being to cut losses quickly and let profits run. 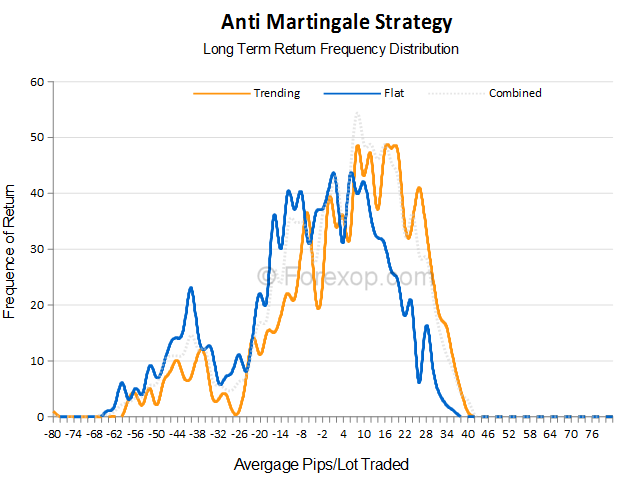 Anti Martingale is an effective trend following strategy. Unlike forward Martingale it doesn’t have “fat tail” risks. Take the following example in Table 1. This shows how a “double up” sequence works in practice. I’ve set a virtual take profit, and stop loss target of 20 pips. The price starts at 1.3500. I start by placing a buy to open order. The price then moves up 20 pips to 1.3520. Following the strategy, I now double the size of my position. I add 1 lot at the new rate of 1.3520. Table 1: A “Double up” trade sequence. This gives me an average entry price of 1.3510. I continue doubling-up the exposure for each 20 pip increment (my definition of a winning trade). At tick 6, the price then drops by 20 pips. Following the reverse strategy, I now have to close the last position. Since it is a loser (according to my criteria). So I place a sell to close order at tick 6. The effect of this is to half my position size, or exposure. I now hold 8 lots instead of 16. Table 2: Snapshot of trade P&L on closing first position. Notice that the last losing trade wiped out all of the profit on the existing open trades, and left me with a net loss of -$2. The net loss of the entire sequence is equal to my stop loss value. This relationship always holds. The total profit of the group has been canceled out by the last move of just 20 pips. At this point in time there are still four open positions remaining. The first three are in profit and the last is at break even. The question is then what to do with these left over positions. At this point, some traders consider that the trend has reversed. So they cash in the profit on the remaining trades before further losses occur. This is what you’d do if you’re mirroring a pure Martingale strategy. Other traders prefer to hold the existing positions and wait. You could do this for example if you have other indicators that suggest the original trend might return. This is a hybrid strategy: In a pure reversal system, the trades in the entire sequence would all be closed at this point. The spreadsheet lets you to try-out various setups and market conditions. You can test the above variations in the algorithm by setting the “lose multiplier” parameter. Like the original Martingale, the take profit and stop losses are “virtual”, in that they only define winning and losing trades. And so when to increase or reduce exposure. As with grid trading, you would typically also set a profit target for the “entire system”. Say for example after N “double up” legs or when the entire system of open positions reaches a certain profit amount. As shown above, the lot-doubling, which marks the Martingale approach, can work against you too. With the reverse-Martingale, the averaging up rather than down means your profits can be turned very quickly into loses should the market turn against you. On the plus side, your loss from a single sequence is limited to your stop loss on your starting lot amount. So say your stop loss is 40 pips, and your starting lot size is 1 micro lot, your biggest loss from a single sequence would be: 40 pips x 1 micro lot. That’s about $4 – depending on the currencies you’re trading. Just as standard Martingale recovers losses on one winning trade. Anti-Martingale does the exact opposite. One losing trade in a double-up progression eliminates the profit of the entire position. This can be seen in action in Tables 1 and 2. The “hitting of stops” can be a significant problem when the price action is especially volatile. 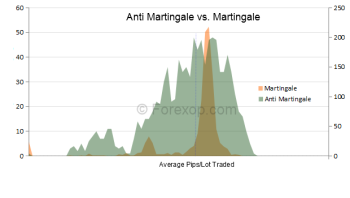 Both Martingale and anti Martingale have equal risk verses reward. That is, they are risk-reward balanced. So say your success in picking trades is no better than chance. This means the system has a 1:1 risk-reward ratio and a net expected return of zero. Where N is the total number of trades, and B is the fixed amount of loss on each trade. In the anti Martingale, let’s say I close the system and take profit after 8 winners in a row. That is, after doubling-up 7 times. The probability of 8 winners in a row is (1/2)8. That means I’d expect this to happen after 28, or after 256 trades. This is because in this setup all other combinations, other than 8 winners in a row results in a loss. The same is true whichever number you choose. In practice of course, your expected net return, and risk-reward will be slightly less than zero because of spreads and other fees. That’s assuming your trade selection is no better than chance. Of course, the aim is that trade selection is better than a coin flip. The standard Martingale system blindly doubles down on consecutive losing trades. Without proper controls this can take the trader into deep drawdown with disastrous results. The profit-loss pattern of anti Martingale is the opposite of this. Typically, in this strategy you see frequent small losses, and a few one off big wins. You rarely see the scary drawdowns that you get with Martingale. This can be seen by comparing the two return charts. Notice how much smoother the returns in the reverse strategy are. The reason being that loss exposure is cut rapidly, and doesn’t escalate at an exponential rate. The “saw tooth” appearance of Figure 5 shows these “rare but catastrophic” losses. You will still see losses in the reverse system, but these are more contained. What is the downside with it? The downside is that you also won’t get the smooth steady returns that are possible with Martingale. In the spreadsheet I’ve used the first derivative of the 15 day moving average line. This is a very basic indicator and simply tells me if there’s a trend, and in which direction. With anti-martingale, the indicator should “say” when there’s a high probability of an existing trend, or the start of a new trend. These are just a few examples. For more on this and on choosing a market see here. Some of these are more subjective in interpretation and are difficult to automate. However the stronger the combined trend signal you have, the higher the chances of a profitable trade sequence. Warning Beware of relying on technical indicators on their own. Ideally, if you’re trading manually or creating an expert advisor, you should incorporate a fundamental viewpoint as well. This is harder to do if you’re using automation. To see the potential for false signals, see the spreadsheet and take a look at the chart. Press F9 a few times to run the calculations. You’ll notice common technical patterns appear in there time and again. Namely trends, tops, bottoms, head and shoulder patterns. Even Fibonacci levels and supports and resistances appear to be there. Without other input these kinds of patterns can lead to false signals. An average spread of 4 pips was also used. The results are summarized in Table 3. 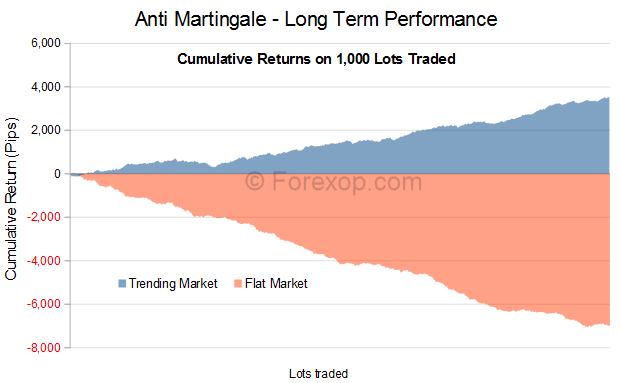 Table 3: Anti-Martingale – Summary of long-term performance. The important thing to take away from this is the marked performance differences. Anti Martingale doesn’t do well in flat markets. See the huge difference in the mean returns. In fact, it does far worse than random. This highlights the importance of choosing the right strategy for the right market. Figure 1 shows a typical profit pattern from a single run. Compare this to Martingale, in which the drawdowns are frequent and severe. Click here to open image in new window. The figure above shows the frequency distribution of each of the different market conditions. Notice how the distribution of returns for “trending” is shifted to the right. This represents the higher returns. The following Excel spreadsheet will allow you to test the strategy yourself and try out different scenarios. You can configure different volatility and trending conditions, then see first-hand how the algorithm behaves. There’s no point running both Martingale and Anti-Martingale at the same time, in the same market and with the same setup. The strategies are opposites, and suited to different situations. While standard Martingale works well in flat, range bound markets, anti Martingale is better suited to volatile, trending markets. That’s not so say it won’t work sometimes in flat or trendless conditions. It’s just the idea behind it is to escalate the exposure on a rising or falling market. This is where most of the big profits are made. The “preference” for trends makes the reverse algorithm better suited to trading volatile pairs or for positive “carry” opportunities. Table 4 below shows the long term performance characteristics of both algorithms. The data is based on 1,000 runs of both algorithms under different market conditions: flat, bullish, and bearish. Each run can execute up to 200 trades. This sample data therefore consists of 1.2 million data points (1000 x 6 x 200). In all cases, the trials execute trades in multiples of 1 lot. The return for each trial is measured as the return in pips per lot traded (total pips/lots traded). Table 4: Performance comparison Anti-Martingale vs. Martingale. Figure 3 below shows the return distributions of both strategies. As can be seen, the distribution of Martingale is highly peaked with a double “fat tail”. The most negative of which is well “off the chart”. The worst case run returned a massive loss of -772 pips/lot – shown in Table 3 above. The long term averages, as shown in Table 4, highlight the variability of performance, depending on market conditions. Anti Martingale gives a much stronger mean return in a rising/falling market. However, this is exactly where the conventional strategy suffers. Mostly due to “doubling down” against prevailing trends. Whether the trend is bullish or bearish doesn’t have a significant impact in the outcome. The heavy tail results in a very large kurtosis. The figure above shows the long-term cumulative gains in pips for Anti Martingale. The return graph is significantly smoother than the standard Martingale returns below. In Figure 5, you can see the returns from Martingale show a characteristic “saw tooth”. These demonstrate the big “one off” losses that happen in the “classic algorithm”. The reverse strategy is better suited to volatile, trending markets. 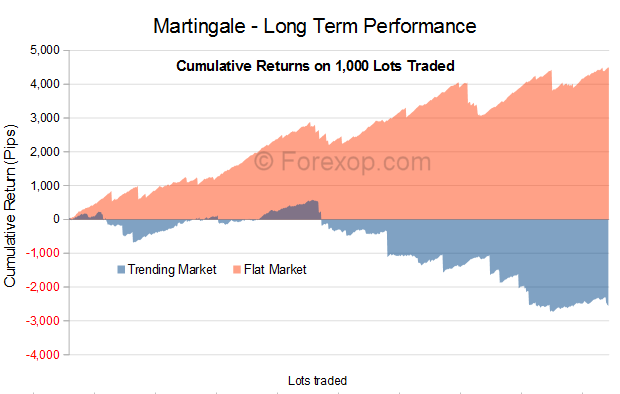 However, Martingale gives better results in flat, predominantly trend-less markets. Both strategies yield an expected long term return of zero. Therefore, choice of suitable currency pair, market conditions and entry signal are critical to success with either strategy (see return charts). Standard Martingale is characterized by steady, positive returns, and “one off” big losses. These appear as “fat tails“ in the return distribution (see comparison return graphs). These lead to highly variable outcomes in the long run. 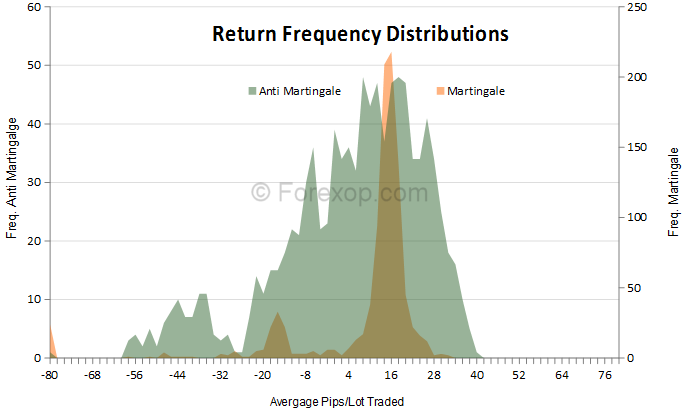 The return distribution of Anti Martingale is significantly flatter, with lower variance as overall returns are more “clustered around the mean”. Optimal long term returns can be achieved by “flipping” between the two strategies according to the market conditions. This can be automated if you’re using and Expert Advisor. It decreases exposure on losses, and increases it on profits. Most traders believe that makes more sense than doing the opposite. Like Martingale, it has an outcome and risk-reward that can be statistically estimated. It’s well suited to algorithmic trading. It doesn’t encounter exponentially increasing losses – provided stops and take profits are correctly executed. Using the forward system it’s difficult to profit from trends. Even when a strong trend is detected, the upside is limited to a linear progression. The doubling up of position sizes can work against you. If your biggest trade loses, it wipes out the gains for the entire sequence. The big lot size multiples means there’s a risk of heavy losses if your stops are overrun. This can happen if the market gaps and falls through your stop levels. Execution problems with your broker can also cause stops to fail or to execute at levels that make the outcome unprofitable. However this is a problem most algorithmic strategies are prone to. 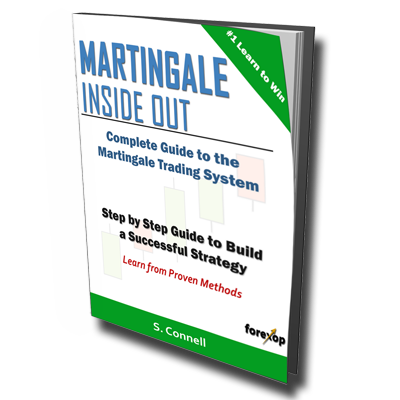 For more information on Martingale see the eBook. Hey Nigel and colleagues, thank you for the great ideas and the article! Surely a basis for a lot of interesting ideas. My idea is to combine an Anti-M grid strategy with a Martingale hedge. If anyone wants to chat the development of such a thing, feel free to drop me a message ( peterjacobs087 at gmail.com) . What is the idea about this thing? It gives us place to move, chances – if as in a) we have 1.300 2 up 1.310 1 down, then if price goes to 1.290 then we are at zero. When position is in c) we have 1.320 4 up 1.330 3 down, we can endure till price 1.290 that we are zero. Until that we can continue for the trend to increase the size of our profits going up. I am doing it just for my passion of trading (4 yrs already) and want to always improve. Martingales are enticing, but mathematically disadvantageous, as described previously (linear profits vs exponential drawdowns). However, if the right deployment spot is selected, it can make for an excellent strategy. Can you recommend any resources to identify/backtest deployment spots? Anti Martingale has been overlooked. If your going to shoot that turkey with any success, you will need an accurate scope. What I use is a 200ema,100 ema, 50 ema. with bollingers (2 of them) set to 1.381 and 2 deviation. First position (Eur-Dol.) trending long at the break of the fifth wave. Second position after a bounce off the 200(or through the 200)and a rally to the 50 ema. Fourth position a retest of the 100 ema (4x+4x total lots). I close all positions on a fib extention of 1.28 to 1.618 depending on support ,trendlines, or longer term fib ratios. If I enter on accumulation stage or distribution stage I will switch over to a martingale system. On distribution of price movement ( long ) the backside of each wave will lean backwards and through the accumulation( long ) phase the front side of the wave will begin to lean forward. Going long you will notice that the retracement after the completion of the final wave (” third mountain top” ) will straighten out to about 45 degrees and then fall off the table. I guess by now you can tell I am a short seller. I have some other indicators, could get by without them. Wave count in each time frame with a fib study, completes my trading system. I do keep a close eye on the economic calendar also. Hope this has been some help to the up and coming traders. My thinking with different pairs is that it depends on the trader. Maybe you are one of those people that get in the zone and when you win is not dependent on the pair but on your state of mind and focus. Then it would make sense to treat every trade independent of pair as a part of a modified anti martingale strategy. Otherwise not. I have run some simulations and I have to say that an anti martingale strategy where not 100% winnings are reinvested seem really logical. Risking 1% of 100000 (1000 in first round in other words). (Winning percent 50%, doesn’t really change the calculations but how often we get winnings streaks. Lets risk a lets say a forth won capital since last loser. We first win 1500 Lets risk 375 extra next time. If a loser we are now down 1% of 101500 and 375 extra. 100110 in other words. Not that bad, still positive. I have run simple excel simulations of this and over the long run never seen this system get beat by the straight linear system. But I have run a monte carlo simulation of this a few times (1000 trades in a series 10000 times) and the average is always better (by a lot) with using a modified anti martingale. The lowest outcome is lower (it actually is quite easy to calculate worst case since that is if you get every other winner and losers. But frankly. That is highly unlikely. The hard part is of course how to implement this. Do the strings of winners depend on my focus and ability or that a pair is behaving in a way that makes it easy to trade? Do I make a system where a winning trade in the EURUSD makes me raise the risk only on the next EURUSD trade or on the next trade independent of which pair it is? It’s an interesting idea, and would make logical sense to lock in the winnings, and not reinvest all. I’ve used very similar strategies with martingale. But there you have the reverse position – as it’s the counter strategy. What I do is increase my stake on each round (by locking in winnings). That additional exposure reduces the probability of being knocked out (by allowing greater drawdown). If you are reducing exposure on each round, according to winnings, that can be done by taking a smaller trade size on each round, or reducing the number of allowed legs in your trade sequence. Not sure what your reasoning behind switching pairs is. But I would also say there’s strong market dependence, as to when each strategy works and the results achieved. So switching to a new pair, following winning trades on another would be somewhat unpredictable. How about an anti martingale grid? Hey, I think this is a beautiful article and is the basis of nice ideas. I am designing something like an martingale and an anti-m grid Nigel…so please feel free to chat me up! Overall my desire is to make a martingale grid, that in case of a trend goes into an anti-m one.